As I was watching Danganronpa: The Animation for my look at the five anime you should be watching this summer, I realized two things: 1) that I really wanted to play the game and 2) the anime was going to take all the fun out of it by spoiling every single mystery. So I immediately went out and grabbed the game for myself. And I am glad I did. Because Danganronpa: Trigger Happy Havoc mixes the great courtroom battles of Ace Attorney with the compelling mysteries of Zero Escape in a way that makes the anime version seem little more than a pale imitation of the game. On his first day at Hope's Peak Academy, the most prestigious high school in all of Japan, freshman Makoto Naegi is knocked out only to awaken trapped in a twisted version of the school. Worse yet, the only way to escape is to murder one of his 14 fellow classmates and get away with it. Of course, the same conditions for escape apply to all his classmates as well. What follows is a series of twisted and complex murders surrounded by the even greater mystery of what happened to the school, why they have all been chosen to compete in this death game, and who is the mastermind behind it all. The game itself follows a pattern similar to the Ace Attorney series. When a murder occurs, Naegi gathers evidence from the various crime scenes and interviews witnesses as he tries to figure out the murderer. Then the remaining students have a "class trial." However, as there are no lawyers, it is a chaotic free-for-all conversation with a time limit—forcing the player to think as quickly and creatively as possible. The courtroom gameplay is largely comprised of sections where you "shoot" down your opponents' arguments with evidence "bullets"; but there are several other mini-games as well that keep everything feeling tense and fresh. But the best part about the courtroom sections of the game is that they are fully voiced (unlike the rest of the game). Here the cast really gets to shine, especially Naegi—who you may recognize as the voice actor for Shinji from Evangelion—and the evil robot teddy bear/game master Monokuma. In fact, Monokuma is easily the most disturbing feature of the game as he has the voice of Japanese children's icon Doraemon. Imagine if you had Jim Cummings (the voice of Winnie-the-Pooh) voice a foulmouthed, murdering robotic teddy bear in his Pooh voice. Then you might start to understand how weird and discomforting this is on a cultural level. But this discordance between what you expect and what is presented in Monokuma's performance makes him easily the most memorable (and darkly enjoyable) character in the game. The rest of the cast is interesting as well. As Hope's Peak is the premiere Japanese high school, each student is the very best at something—ranging from the super high school fashion model and the super high school fighter to the super high school otaku and the super high school gambler. Moreover, each character has his or her own distinct personality and visual style. These differences lead to one of the best things about the game: In the downtime between murders, you are able to spend personal time with the characters you choose, learning more about their back stories and unlocking skills that are helpful in the trials. And sometimes, you may even get a hint or two about what would drive each to murder. While the murder mysteries are well thought out and quite elaborate, the game can get a little frustrating from time to time. Often this isn't because you're behind on solving the mystery but rather that you are ahead and aren't sure what minor stepping stones you need to cover to get the game to catch up. Other times, the game can be a bit unclear on how to properly use the game's various systems to prove your point in trial. The worst of these are the times when you must point out a contradiction in someone's accusation, using someone else's accusation in the same conversation. It's often hard to tell which one to grab as evidence and which one is the contradiction that needs to be shot. As I mentioned above, outside of evidence gathering and courtroom gameplay you will have free time to get to know the other characters. However, this time is so limited that you will only get to know two or three of the 14 other characters on your first playthrough. To get to know the ones you missed, you must replay certain chapters of the game. And even with the fast forward text feature, this can easily take fifteen minutes before you get to the point where you can hang out with them. But just hanging out with them doesn't necessarily unlock the next section of their backstories. Rather you must also give them a gift. There are about a hundred gifts you can collect in the game and only one way to get them: a random prize dispenser. To get a gift from the dispenser, you must insert a monokuma coin—which you obtain as a reward each time you beat a courtroom section or by clicking on each and every random object once per chapter to find hidden coins. Then, as you are only able to get one gift at a time, you must watch the same seven-second animation each time you put in a coin. And as collecting one of each gift unlocks various bonuses, you'll likely spend hours of monotony putting in coins and watching the wheel spin. All in all, Danganronpa: Trigger Happy Havoc is a great visual novel. It has great characters, an excellent set of mysteries, and courtroom gameplay that is as exciting as it is engaging. The game's flaws are minor (though time consuming), and they will probably only bug completionists who feel the need to discover every secret the game has to offer. If you like the Zero Escape games or the Ace Attorney series—or just a good story—you shouldn't pass on Danganronpa. 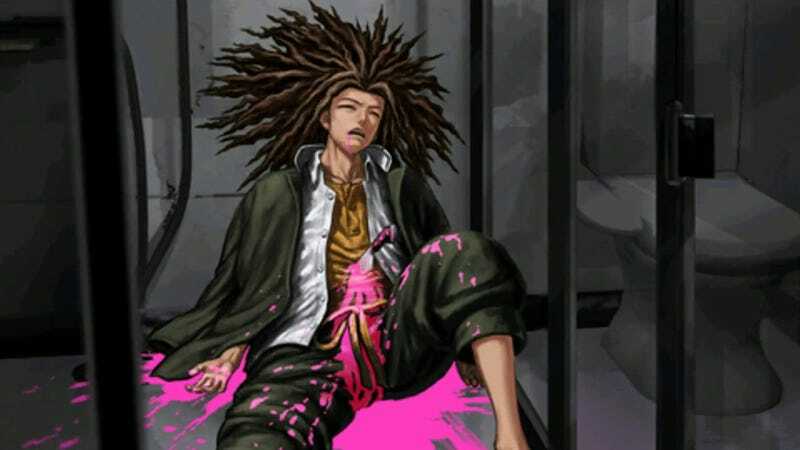 Danganronpa: Trigger Happy Havoc was released on November 25, 2010, for the PlayStation Portable in Japan. While the PSP version won't be getting a Western release, the upcoming Vita remake is scheduled for a Western release in 2014.